Come stargaze under clear skies- park the car and walk downtown! To book either guest home, email Liz directly for best rates at sibley1@me.com or for convenience book through airbnb or vrbo. The Alpine Studio in downtown Alpine, is within walking distance of restaurants, shopping, libraries, and parks. The 1,000 square feet 2 bedroom (3 beds), one-bath home is "all yours" - with two private front entrances and a back door leading out to the yard with a dining table and six deck chairs for stargazing. The Alpine Studio is pet and child friendly, filled with art, spacious, colorful and charming. Murphy Street is artsy and funky and folks are super friendly. Parking on the street by the front door is easy and super safe - as is all of Alpine. Please note that the Alpine Studio is located across the street from the Amtrak station and train track, so there is some train noise. I provide complimentary individually wrapped earplugs for sensitive sleepers, just like the Holland Hotel, 1 block away (the "nicest" hotel in town). In the front room is the king bed, with a dreamily comfy organic Talalay latex and cotton mattress. In the next room (separated by privacy curtains) is a full size and a twin bed. Each bed has soft sheets , down pillows and light down comforters (nights are chilly in the high desert). There is central AC/heat. The sized-down kitchen includes a double sink, microwave, cook-top, and mini fridge. 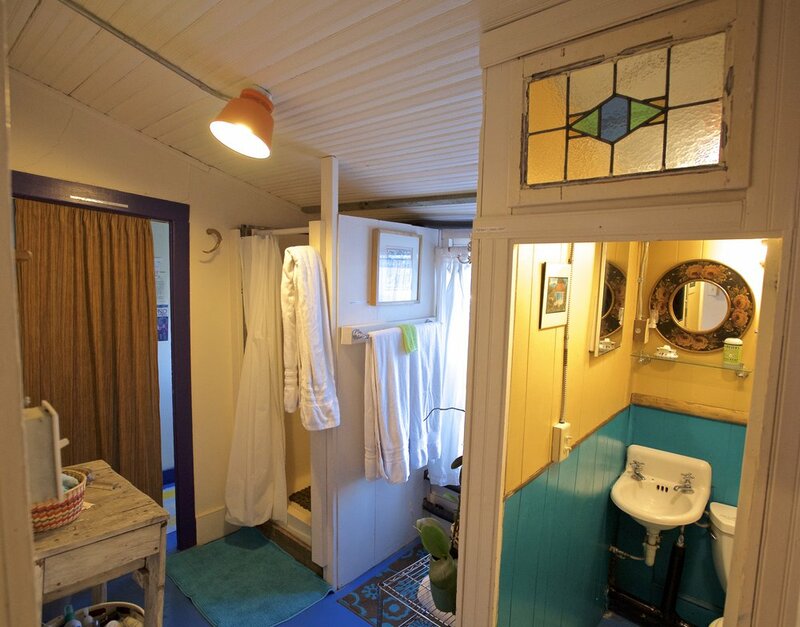 The bathroom has a shower, with separate toilet and luxe bath sheet towels. There is a washer/dryer in the laundry room. The flat screen TV with DVD player (no cable) offers a relaxing movie night experience after a long day of desert exploration (DVD's provided). There is high speed internet. The Alpine Studio has been one of my favorite places to stay with Airbnb. It is perfectly located near the main street of town which is very walkable. The house is decorated so nicely with lots of cool local art, the kitchen is stocked with everything you need, the beds are super comfy, and the backyard is perfect to take a load off and relax in the sun. Liz offers all kinds of little extras and left a really nice list of things to do and recommendations around town. We thoroughly enjoyed our stay here! On our second trip to West Texas, my husband and I wanted to spend more time in Alpine... The Alpine Studio and Liz the owner is the reason we use rental property and no longer stay at hotels. The process of renting the property was smooth, professional, and accommodating to our questions and needs. The Studio itself was quaint, cozy, and the representation of the town of Alpine. Liz does a wonderful job of creating an atmosphere that is relaxing and educational at the same time. The Studio allows you to swim through Alpine's past and present with books, NPR radio schedule, maps of the area, suggestions of what to do and where to eat. All you need is within walking distance or a short drive across the tracks into the quaint and friendly town. If you can't find what you are looking for Liz is a phone call or text away to help. The Alpine Studio is unique, but amenities you would find in a hotel and more are provided. The kitchen has enough space and workable room for small meals. Location, location, location! Liz not only has the cutest studio on the block, it is in the best location in Alpine. The space doubles as an art studio, which was so unique and fun. The backyard has plenty of space and has nice furniture to sit and relax in. Communicating with Liz was fast and easy. Getting in the studio was easy with the lock box, which I feel can be hit or miss. This was definitely a hit :) Once inside, we were so impressed with the decor, it truly is a one of a kind. I would recommend this space to anyone who asks, you really can't go wrong with this studio!